Is Family Breakfast the New Family Dinner? And by that question I mean, is it easier for families to get everyone around the table at the same time eating the same thing first thing in the morning — before the playdates and the meetings and the deadlines conspire to pull everyone in different directions? In case you can’t tell by now, we’re big fans of a shared meal at the end of the day. But that’s most likely because, after a few harrowing years with apron-hangers and witching-hours babies, we’ve found our dinner rhythm. We know the meals we can make blindfolded. We know what kind of surgery — rice removal surgery — has to be performed on the porcupine meatballs in order for Phoebe to eat them. But if morning is the best time for your family to unplug and connect — what’s stopping you from declaring breakfast the new family dinner? Actuallly….What’s stopping you from declaring the all-parties-present road trip or bike ride or the weekend hike the new family dinner? For all of our inspired steaks and salads, we here at DALS haven’t yet cracked the breakfast code. Every week at Trader Joe’s we beg the girls to keep breakfast in mind as they shop — we will buy them anything if it doesn’t fall into the starch-fest category, aka pancakes, bagels, waffles, french toast, aka their morning-time default mode. (Our morningtime default mode: Smoothies, which the girls go back and forth craving and rejecting.) But no matter how many cartons of strawberry yogurt and granola we lug home, we’re usually back to our pancake routine by Wednesday. If I’m feeling ambitious, I’ll have Nigella’s homemade mix in the countertop canister, but it’s usually Trader’s buttermilk batter we’re shaping into silver dollars and the girls’ initials. If we’re going to have the same thing every day, might as well make it interesting. Initial Pancakes (shown above) I find they turn out better when you drizzle the letter into the pan in its mirror image and then flip to its correct positioning. Fakey Crepey Remember when we handed the girls ten bucks and challenged them to find something new at the farmer’s market? The first time they came back with lavendar honey and two sourdough rolls. The second time, they wisened up and found the newest vendor at the market: they found the crepe guy. 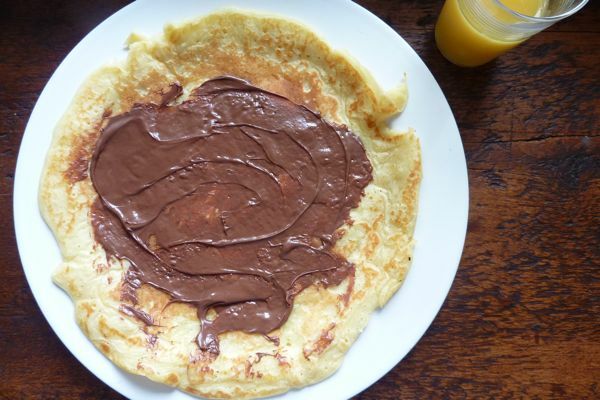 With his French accent, twirly wand, and charming little cones, I am no match for him, but I make what Abby now calls my “Fakey Crepey,” achieved by thinning out my pancake batter with milk, then smearing Nutella across the middle. It ain’t Paris, but it’ll do for now. Silver Dollar Stack A perennial favorite in my house. (How could it not be?) The trick is to pile the tiny cakes as dramatically high as possible. Um, who takes their kids grocery shopping unless they have to?! And how do you NOT wind up with oreos and handi-snacks?? Susie: Who said we don’t end up with oreos (um Trader O’s) and snacks? We just had breakfast for dinner last night! I think my addiction to the egg has now reached a new extreme — I’ve been on such an egg kick, the past few weeks I’ve had a boiled egg every single day for breakfast and now I’m throwing them in at dinner as well! Breakfast, it’s what’s for dinner! 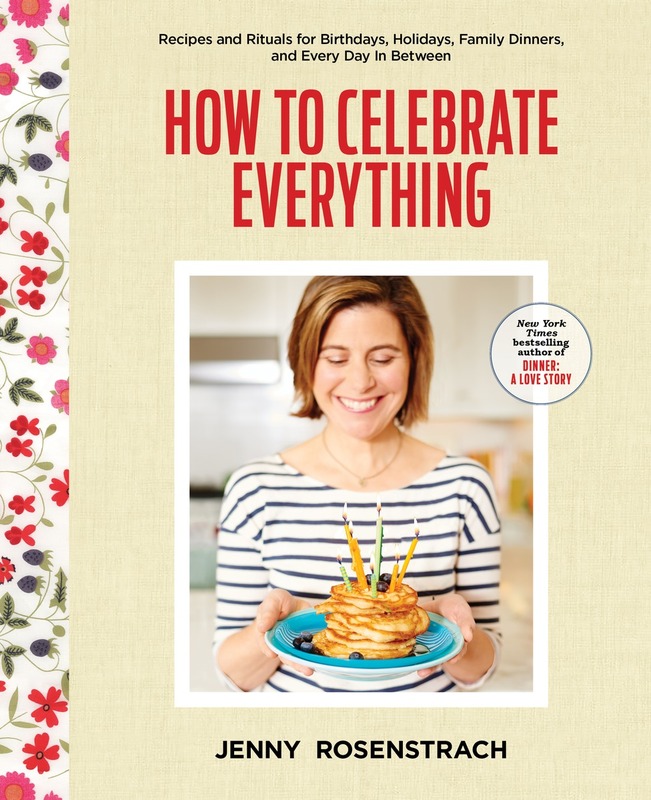 I have a secret stash of those delicious Trader Joe’s hash browns in the back of the freezer for these occasions – sometimes it’s eggs and toast and sometimes it’s pancakes and fruit. A friend has a great way of dealing with breakfast with her 3 and 6 year olds during the week – she designates days for breakfast items. Monday is pancakes, Tuesday is eggs, Wednesday is oatmeal, Thursday is yogurt and granola and Friday is bagels and cream cheese. I like this because it gives you something different everyday and it ends the arguments she gets into with what she is willing to make for breakfast that day. I eat breakfast for dinner on a regular basis – sometimes pancakes or waffles, many times quiche, or sometimes my husband makes his specialty, egg and cheese sandwiches. (i was making them for my son one day and he asked if i needed to ask daddy for the recipe.) it definitely is a meal everyone will eat, and there are endless possibilities to health-up the starchfest a little. Lots of fruits will go well in or on the pancakes and i like to play around with that a lot. lemon-ricotta are my favorite (with blueberry sauce), but i’ll usually toss in any kind of fruit that’s lying around. they also go nicely with a smoothie, which is also a crowd-pleaser! thanks for the reminder to make those more often. 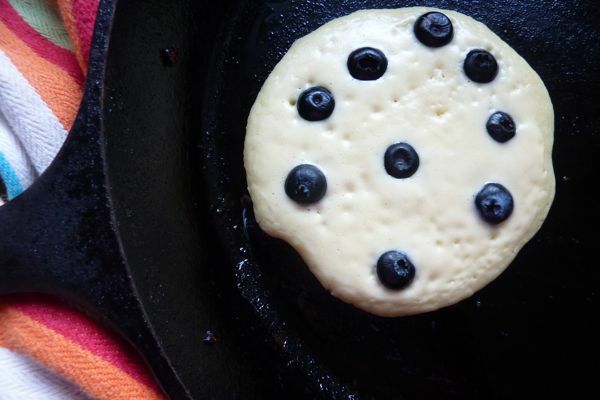 @Jenny – Your initial pancakes are my new breakfast inspiration! Also, I love reading your blog. I don’t have kids yet [not married yet either so not even close :)] but, I hope that when I do, I’ll be as cool a mom as you are. 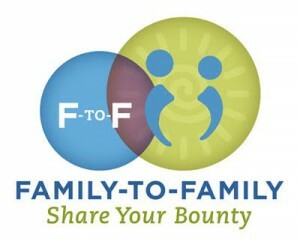 And, I promise to make family dinner an important part of our daily lives. @Siera – You’re not alone. I’ve tried for years to like that stuff. I mean, if everyone else is so crazy for it then it must be good right? Not to me. I let ’em keep their Nutella and I keep my peanut butter… with bits of dark chocolate mixed in or a drizzle of honey on top occasionally. Eggs are for dinner, pancakes are for breakfast! 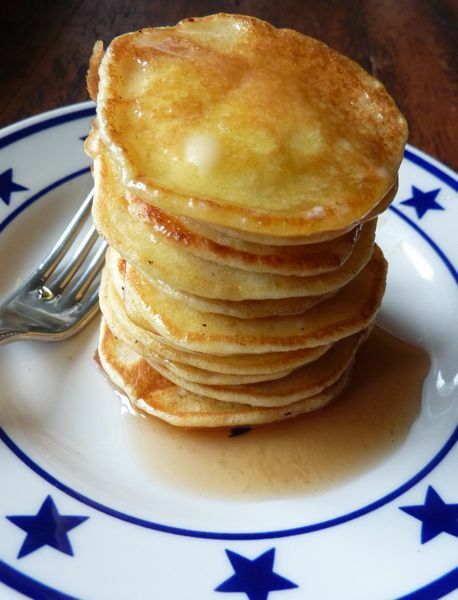 Because these go from pan to plate, the kids stay at the table, waiting for their turn for the next pancake. Heat a round cast iron griddle pan* to a medium heat, swipe it with a high-heat tolerant vegetable oil, swirl a thin layer of batter. Flip as soon you can slip an icing spatula underneath, cook only for a few more seconds. Serve right away, but if you have batter left over after everyone is full, keep cooking – they are good cool too. Recipe reduces beautifully to a 1 or 2 egg version, but 3 is pretty much the max to fit in a standard blender jar. If your blender is on the small size hold back 1/3 of the milk to add after putting in the dry ingredients, when the mixture has deflated a bit, otherwise you’ll have an unholy lumpy mess, trying to cram it all in. Love the initial pancakes. My dad always made the last dregs of the batter into our initials growing up. Happy to be doing it now for my kiddos. After working with families with picky eaters for years now, I’m in total agreement with you – family breakfast is the new family dinner in many homes! It’s a great way for families to eat together in today’s reality of long commutes, late work hours/ shift work and extra-curricular activities! I love this. In my family growing up we very rarely all made it to the dinner table at the same time except for Friday and Sunday night, but breakfast was every day together. Even if it was just cereal and fruit, we would sit together before running off to school and though it didn’t last longer than 10 minutes, it was a nice ritual. We are a breakfast together family more so than dinner together family mostly due to work schedules… I believe that as long as you are all together at some point of the day- sharing a meal- that deserves the A+ for effort. I like sprouted grain raisin cinnamon bread for french toast, which I just keep around in the freezer since I read you french toast post. I figure it is at least a dose of healthy carbs, and it is the only way my toddler will eat eggs! The bread is so tasty we don’t need syrup. Our breakfast routine is pretty consistent and unfortunately does not lend us a lot of time together. I am up first, around 6, and I HAVE to eat immediately. First thing I do before open my eyes is get the Keurig going and reach for the package of TJ’s whole wheat cinnamon raison english muffins. And then I sit in peace and quiet and enjoy….selfish? Perhaps. My son toddles down somewhere around 7:30 and unlike his mom does not need to shove food immediately into his face. Sometimes I fed him, sometimes the nanny does. 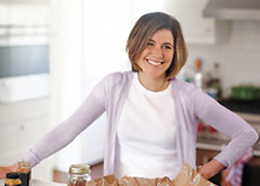 My husband doesn’t really eat breakfast – I KNOW! There are days he’ll go until noon or 1 without a piece of food. I don’t understand it. Weekends are a bit different – most Sat/Sun I can get my husband and son to sit down at the same time and I’ll stand by the kitchen bar to serve them whatever I’ve whipped up. They love these: http://a-life-from-scratch.com/sunday-morning-blueberry-muffins/ I’m more than happy to make them so that my husband will have a ‘grab and go’ breakfast all week. I love this new perspective! And once again you inspired a recent post of mine for the love of breakfast! 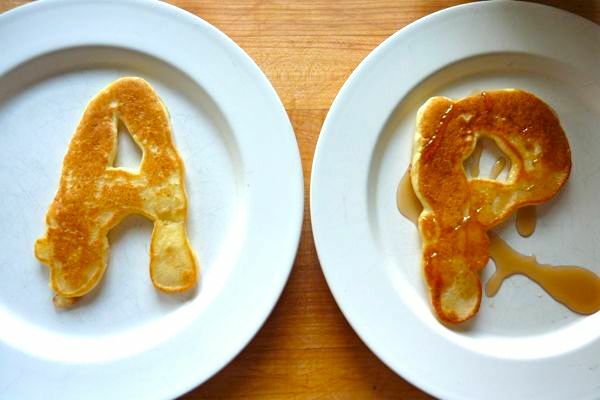 I tried the letter pancakes this morning and they loved them… next time they challenged me to spell their whole name! Thank you!